The Park is accessible by public transports. There are three main train stations and a bus stop where you will find directions to the path leading up to the Monte Barro Hermitage. You can also reach us by car or by a private shuttle bus service (contact us for an estimate). On foot: following the 311 trail, which is signposted outside the train station, you either arrive to Camporeso or the nearby climbing area. Both places lead up to the Archaeological Park of Piani di Barra. From there, just follow the road that leads straight up to the Hermitage. On foot: from the train station, head towards the village of Malgrate Gaggio and then follow the 306 trail, which quickly leads to Pian Sciresa. From there, switch to the 301 trail which brings you to a road that you have to follow for 5-10 minutes in order to reach the Hermitage. On foot: walk through the city centre past the waterfront of Lecco and across the “Ponte Vecchio” where the 304 trail starts. This path quickly leads to Pian Sciresa from where you connect to the 301 trail, which brings you to a road that you have to follow for 5-10 minutes to reach the Hermitage. By bus: from the station, bus line D55 leads directly to Galbiate. On foot: following the Parco Monte Barro signposts, you can reach the Hermitage; in order to do so, check out the trail map of the park, since there are several paths that lead up to it. These include 301, 302, 307 and the main road. Following SS36 road, exit at Civate-Oggiono-Lecco lake. Then follow the signs for Galbiete and, from there, follow the directions to the Monte Barro Park. Be careful not to end up at the Park Headquarters. Instead, look out for “Eremo di Monte Barro” and “Eremo Restaurant”, following via Balassi until the end of the road. Following SS36 road, exit at Pescate. Then follow the signs for Galbiate and, from there, follow the directions to the Monte Barro Park. Be careful not to end up at the Park Headquarters. Instead, look out for “Eremo di Monte Barro” and “Eremo Restaurant”, following via Balassi until the end of the road. Coming from the center, cross the lake from one of the bridges and follow the indications for Galbiate and then for the Hermitage. 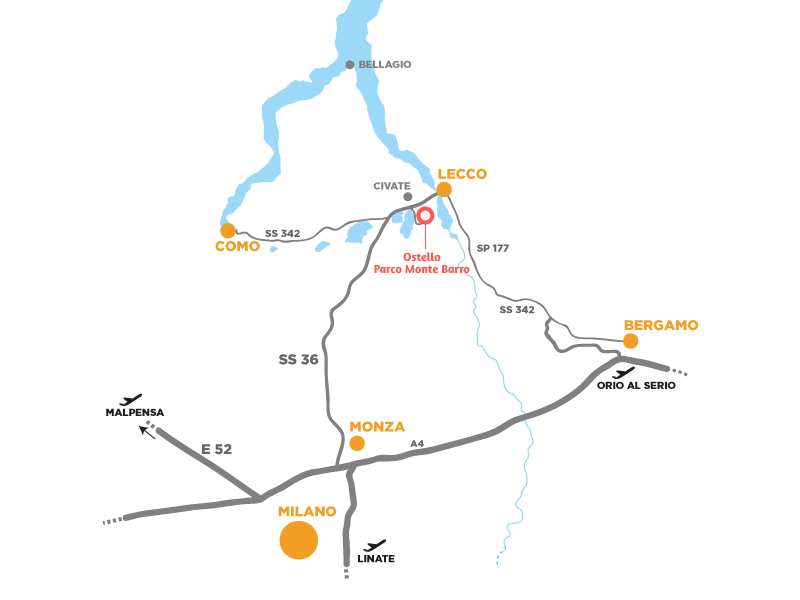 Follow the SS671 road, SS342 and then SP177; you can follow the indications to Lecco since you exit from the airport. Reached Pescate, at the roundabout, take the road going up towards Galbiate, following the signs. Be careful not to end up at the Park Headquarters. Instead, look out for “Eremo di Monte Barro” and “Eremo Restaurant”, following via Balassi until the end of the road. On Sundays and public holidays, usually from Easter to September, the road that goes from Galbiate to the Hermitage is closed to traffic and it is only accessible with a shuttle bus service. Close by, you will find good parking facilities. However, the hostel guests can be granted a special pass to reach by private means the Eremo parking area. In this case, however, please contact the hostel beforehand.